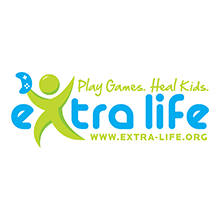 Extra Life unites thousands of gamers around the world to play games in support of their local Children's Miracle Network Hospital. Since its inception in 2008, Extra Life has raised more than $50 million for sick and injured kids. Sign up today and dedicate a day of play for kids in your community! Be a hero. Sign Up today! Pledge to play games from your home or online on any day that works for you. Ask your family and friends to donate to your fundraising and recruit others to join your team. Raise funds, have fun, and help heal kids at your local Children's Miracle Network Hospital! Children's Miracle Network Hospitals® raise funds and awareness for 170 member hospitals that provide 32 million treatments each year to kids across the U.S. and Canada. Donations stay local to fund critical treatments and healthcare services, pediatric medical equipment and charitable care.